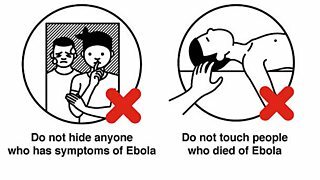 With the Ebola crisis growing quickly, how could the BBC distribute public health information to people in West Africa so they could receive it directly on their mobile phone? That was the challenge set last October by the then director of the BBC World Service, Peter Horrocks. 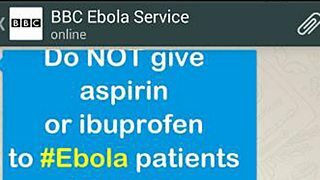 At the time the BBC had already started special public health programming on ebola for its World Service radio and global TV audiences. This not only gave up-to-date information on the spread of the virus - it also provided valuable and potentially life-saving information for those in the region on how to reduce the risk of catching the disease, understanding the symptoms and where to get help. We wanted to do more though. We knew there was a significant opportunity to reach people on their mobile phones, if we could figure out a way to do it quickly. There was no point in trying to develop an app, with the development time and expense that would incur - let alone the time it would take to promote it and get people to download it. We needed to distribute content inside an app that already existed and was already being used widely by people in the region. This is where the idea of using WhatsApp emerged. We had already successfully experimented with it during the Indian elections in 2014 and gained some very useful insights. Although it had its challenges, we reached thousands of Indians directly on their mobiles and feedback clearly showed we engaged with them in a very effective way. From our Indian elections experience we knew that the work required would be a full-time job and not something that could just be an add-on for an existing team. We managed to free up a dedicated producer - initially Andree Massiah, and currently Carinya Sharples - as well as get some additional cover to help with data entry, such as saving contacts and managing the broadcast lists. 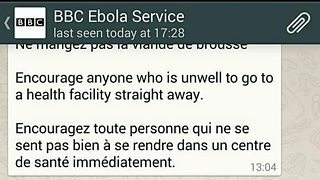 In mid-September, just a couple of weeks after we originally had the idea, the BBC’s Ebola WhatsApp information service was born - the first ‘lifeline’ humanitarian service to be launched inside the app. It was as a dual-language offering, in English and French, so we could maximise the potential audience that could benefit. So how has the project gone? We’d initially anticipated running the account for about six weeks and reviewing the situation just before Christmas. When it came to it, the case to continue was still strong - particularly with the Christmas and New Year holiday period meaning many more people would be travelling in the region. At the time of writing the service is still running and we have more than 19,000 subscribers. Most of these (probably 80-90%) are from West Africa, which we can tell from the mobile phone numbers. The biggest subscriber group is in Sierra Leone, followed by Nigeria and Ghana. We also have a number of subscribers in Liberia, Guinea, Mali, and further across Africa in Tanzania, Kenya and Uganda. In terms of content, we’ve focused on three types: text messages, pictures/visuals and short audio clips, so we could cover the different preferences users may have for understanding the information. We decided not to use video clips as we knew that such files could be too big for many subscribers’ data limits. And we didn’t want to spam our users, so we made sure we only posted a maximum of three items a day. Editorially, we established quite narrow parameters: the content had to be public service information or significant news developments that directly affected people in the region. It had to be short and to the point and be conveyed in simple and easy-to-understand terms. We didn’t post any links back to our website - the point was to get the content that people needed delivered straight to them. WhatsApp is primarily an interactive platform, so we were very aware that we had to carefully monitor the messages we got back from subscribers and follow up with them where needed. We quickly realised that a lot of the questions users were sending in were practical concerns that we hadn’t really understood in our broader coverage of the story. One user asked: “Is it safe to use a public swimming pool?” We’d never thought of that and weren’t sure of the answer. So we got our global health correspondent Smitha Mundasad to do some research and then record a short audio clip explaining the situation. We then pushed that back out to all our subscribers. In the proceeding weeks we received many messages that gave us real insights into what it was like living in the region and the difficulties and challenges people faced. We got tip-offs on stories that we later covered on our main outlets. We found compelling personal stories that we used to enhance our coverage across TV, radio and online. Our WhatsApp producer put together this compelling post on Medium to illustrate some of these stories. The project also quickly became a collaboration within the BBC and beyond. We got huge assistance from our African language services, particularly BBC Afrique which helped with translation and French content. The BBC’s international development charity Media Action helped with its expertise in the situation on the ground, and it was later able to start its own WhatsApp service in Liberian English, complementing its existing community radio projects in the country. We also worked closely with aid agencies like Unicef and the World Health Organisation, which were a great additional source of content such as visuals that conveyed public health messages - collaboration that extended to tech companies too. In additional to the valuable support from WhatsApp itself, the popular South African chat app Mxit - which we’d worked with during the SA elections last summer - created a space within the app to host the audio we were creating for our WhatsApp service. This helped provide factual and relevant information about the disease to the many users of the app in the country. Our business development team in Africa were keen to make it easy for us to share our WhatsApp audio with FM and telecom partners on the continent. SoundCloud stepped in to help us quickly set up two accounts to host the audio in English and French. We were then able to provide RSS feeds of those accounts for our partners to easily pull in the audio content they wanted and broadcast or push that out to their audiences. Feedback from our subscribers has been overwhelmingly positive and appreciative, and that’s been greatly encouraging. I think the collaborative model that has emerged around this project will provide a valuable template for the BBC in covering and contributing towards humanitarian crises in the future.